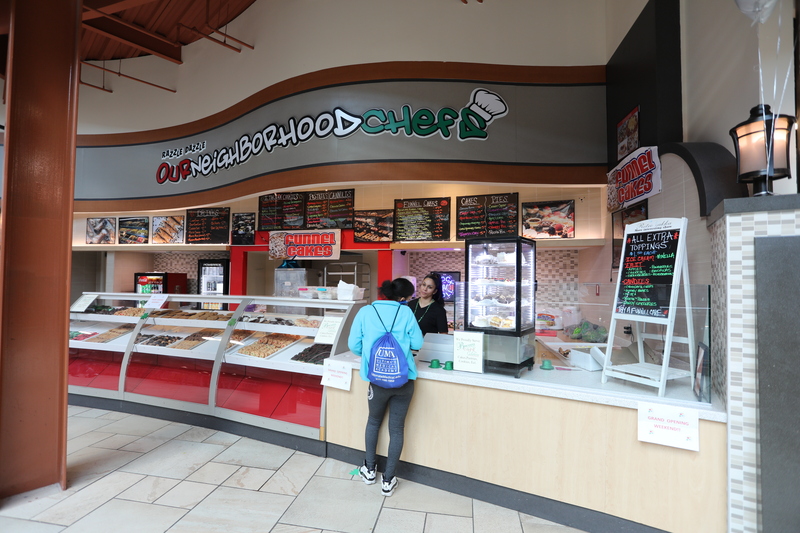 The shop outsources the majority of its desserts – various Italian cookies, slices of cakes, pies, pastries, and cannoli prepared by chefs from the area; including Biscotti’s Café, Cathy’s Cookie Kitchen and more. However, Levy confirmed that nine types of funnel cakes are made on site. In fact, you can create your own funnel cake and even add fresh fruit. Our Neighborhood Chef is located on the 2nd level in the Canyon area next to Razzle Dazzle, known for serving Italian Ice and also owned by Levy and her husband Reverend Curtis Levy. The food sold at both locations benefits a local ministry called Last House on the Block Ministries Transitional Housing, Inc. The ministry houses men and women recovering from substance abuse, mental health issues, incarceration or domestic violence; so, they can learn to become productive members of society. Both Razzle Dazzle businesses help fund the agency in providing extra bedding, resources, staff & other items the clients need.